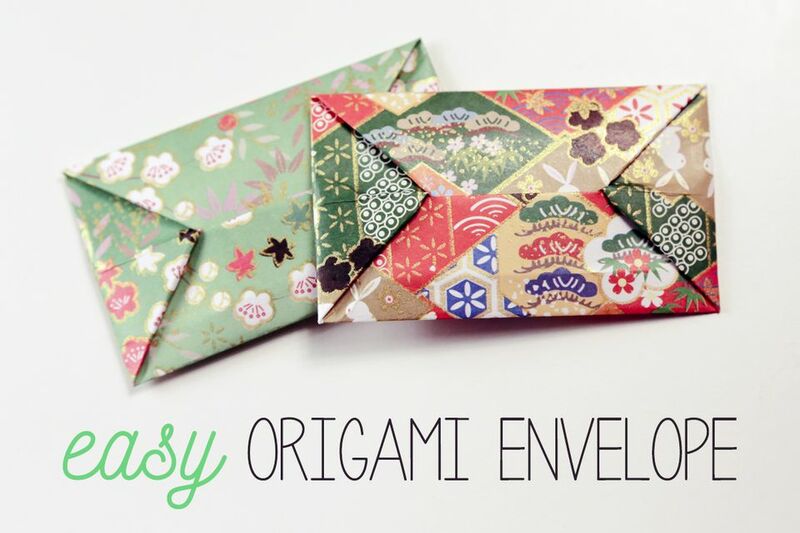 These origami envelopes are super easy because they don't require any complicated squash or reverse folds. They are also very quick to make. Once learned, you can teach all of your friends how to make them! They would be perfect to send your friends or family greetings cards at Christmas, New Years, Birthdays or for your party invitations. You could also use them to organize receipts and other paperwork. You will only need one sheet of square origami paper, any size. 1. Start with your origami paper white side up. 2. Fold the paper in half, making only a small pinch on both edges. 3. Then, fold the bottom edge up to the pinch you just made and make another pinch there. 4. Open it out, you have a half and a quarter marked. 5. Fold the bottom edge up to the second (quarter) pinch. 6 & 7. Fold the bottom edge unto the center pinches. 8. You will be able to see the pinches where indicated. 9. Fold the top edge down to those creases. 11. Fold the bottom right corner in. 12. Fold the bottom left corner in as well. 13. Rotate the paper to the right. 15. Rotate the paper again to the right and fold the bottom up in the same way as before. 16. Rotate the paper to the right. 17. Fold the top right corner in to align with crease on the layer behind. 18. Fold the top left corner in to meet the other. 19. Fold the top corner down. You can now insert the point of the envelope inside to seal it! Make an Easy Origami Card Stand!